As many know who might be reading this blog, this third Thursday of November brings the annual US Thanksgiving day. Like Christmas is a Winter Solstice festival, so this is an autumnal day for memories. We are urged to get together with other people to remember what happened this year that was good, something that meant a lot to us. I can’t meet either demand tonight for myself. The bar is too high. Some good things happened, nothing spectacularly bad. I can say that my older daughter had become a paid freelance entertainer blogger last year here on the Net where she created and made a great success out of an entertainment blog, Fan-Sided, and is very pleased this year to be regular (in effect staff) writer for WETA, specialty British mini-series. You see her above with a central actress in the once stupendously popular Downton Abbey; Laura had told Froggartt that her mother especially bonded with the character of Anna, and Froggartt was generous enough to insist on sending a photograph of herself with my daughter. Izzy carried on being a successful librarian. 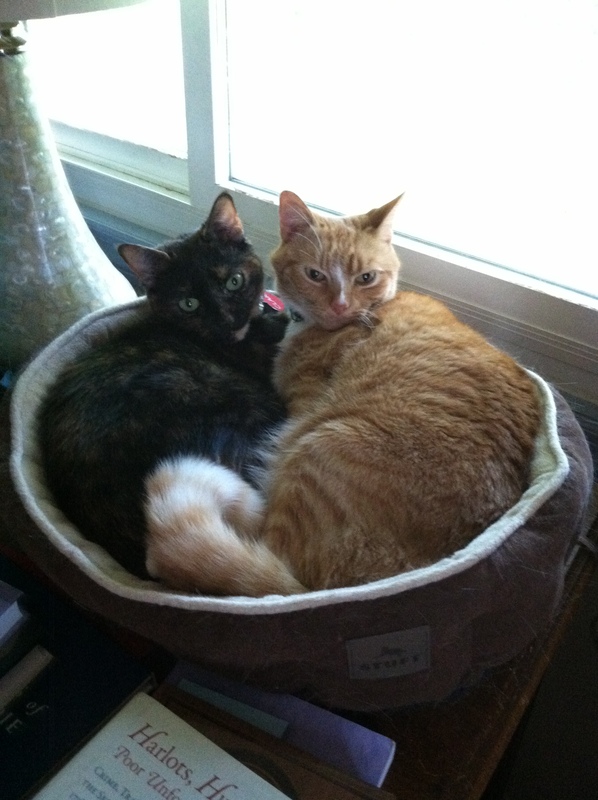 They are now blogging together (Ani & Izzy). Those who read this blog regularly know how I spent the year. Happily this week our local quasi-art movie-house has three (!) decent movies so tomorrow I’ll go with my friend, Vivian to see a film by a film-maker whose work I enjoy very much, Agnes Vara’s Faces Places, on Thursday Izzy and I will make a roast chicken (more than the two of us can eat) and go again to see the latest Jane Goodall documentary, Jane. I used to show these to my writing class in Natural science and tech, and Saturday night, weather permitting or not, Vivian and I bought tickets to go to our first ghost tour in Alexandria. Neither of us have ever done one before. The third is Abdul and Victoria, which I hope will be there next week as I shall go with another friend, Panorea, after which we’ll do lunch. I’ve bought the book. As of night-wanderers, who their woes bewail! And hear his deep sighs swell the sadden’d wind! And soothe the pensive visionary mind! A November afternoon in Leeds (1881?). then keep watch over your own solitude. In Johnson’s hands, biography became a rival to the novel. It began to pose the largest, imaginative questions. How well can we learn from someone else’s struggles about the conditions of our own; what do the intimate circumstances of one particular life tell us about about human nature in general … the long journey of research and writing, somewhere behind them walk the companionable figures of these two eighteenth century presences, talking and arguing through a labyrinth of dark night streets, trying to find a recognisable human truth together … if my book’s title strikes some curious chord in the reader’s mind, it came to me on such a night in the small, deserted public garden that now stands behind St John’s Gate in the City, when a light winter rain was falling like a mist round the lamps. The echo you hear, of course, is Dr Jekyll and Mr Hyde (Richard Holmes, the final page). Perhaps the problem with Woolf’s biography of Fry is he’s not an alter ego (why it feels so distant), while Vita Sackville-West, about whom and whose house Orlando swirls, could be, or is. Virginia is Orlando too. Latest book: Vita & Virginia: the work and friendship of V. Sackville West & Virginia Woolf. I have now joined the Virginia Woolf Listserv attached to the International Virginia Woolf Society. I’ve belonged since 2003, and when I went to MLA meetings, went to every one of their sessions, and once to one of their parties. One coming loss: my Women Writers through the Ages @ Yahoo keeps going awry so no messages may sent or received. There is no one and no where to ask for help. The sites offered take me round and round or offer only boilerplate explanations. I need to move or invite to move the few people still there elsewhere. If not, and this software equipment continues to function badly, I’ll lose some friendships. I hope it does not come to this. I know I’ll return to reading more book of Renaissance women as that is one area few people seem to want to join in on that I know. The very first adult books I ever read were dark brown tomes of the lives of Margaret of Navarre and Jeanne d’Albret. A book on one of TBR piles is Francoise Kermina’s life of her, La Mere passionee d’Henri IV — Kermina wrote the best life I ever read of Madame Roland. Another is Enzo Striano’s Il Resto de Niente, a life of Eleonora Pimental de Fonseca, hung during a revolution in Naples, 1798 (her death concludes Sontag’s Volcano Lover. And study my French and Italian. Nothing is more deeply engaging than going back and forth with women’s poetry. I try hard not to be isolated but if I find I am, I’ll turn back to where I began. I don’t want to kill myself. My Hilary Mantel Wolf Hall lectures/discussions with my OLLI class at American University are going very well and they make me want to return to good biographies and literary studies of such women and the Renaissance too. MacFarquhar on Hilary Mantel and historical fiction: What sort of person writes fiction about the past? It is helpful to be acquainted with violence, because the past is violent. It is necessary to know that the people who live there are not the same as people now. It is necessary to understand that the dead are real, and have power over the living. It is helpful to have encountered the dead firsthand, in the form of ghosts … The writer’s relationship with a historical character is in some ways less intimate than with a fictional one: the historical character is elusive and far away, so there is more distance between them. But there is also more equality between them, and more longing; when he dies, real mourning is possible. I cannot bring Jim back, I cannot reach him. Perhaps through writing fiction, biography one does. A ghostliness; there is a real feeling of the author and heroine beating death in Outlander when she returns to Scotland; and, while there, when the novel switches to the present and characters go look at the graves of those the heroine is with in the 18th century; it has this eerie feel.. Other titles by Mantel are Beyond Black (“Black Book” a subtitle for one of Gabaldon’s chapters) and Giving up the Ghost and I’ve learned Mantel’s first popular books were macabre gothics. Winston Graham’s short stories are ghostly chilling gothics. I need to read, to listen to Gaskell’s Life of Bronte. 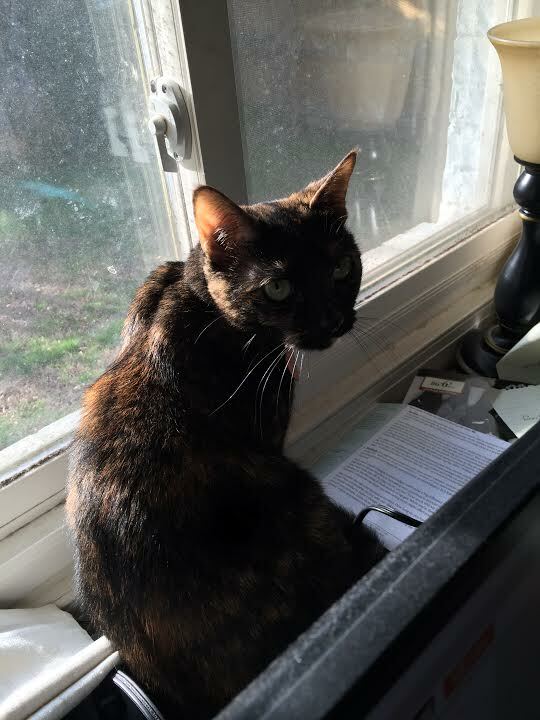 When I’m with aka reading Gaskell, I feel I’m with a friend. I have ever found solace, comfort, models to channel in my reading. I am listening to a brilliant reading of Hilary Mantel’s Wolf Hall by Simon Slater (CDs in my car), and find I am perpetually enriched by new thoughts, insights, reminders of what I know to be importantly true put in new ways. One character whose thoughts and behavior out of grief I find myself remembering, is Thomas Cromwell’s. Early in the novel his wife, Liz, dies suddenly, swiftly of the sweating or sleeping sickness (as it was called in the 1520s). Albeit quietly, he is intensely grief-stricken, misses her. While he has an affair with Liz’s sister, Joanne, because Joanne resembles her sister and is there, and does not remarry for more and far different kinds of reasons than that he finds her as an individual who provided support, comfort, a kind of meaning and stable sane mood to his life irreplaceable, nonetheless he dreams of Liz, finds himself trying to grasp her ghostly presence in his thoughts, his environment, he re-enacts talk with her. He compares what he sees other women doing to what she did. I am nearing the end of the novel where he acknowledges in passing thoughts his relationship to Liz has changed now, his feelings altered. The first year of her death his household did almost nothing to observe Christmas, more than four years later all holiday and other customs are encouraged. 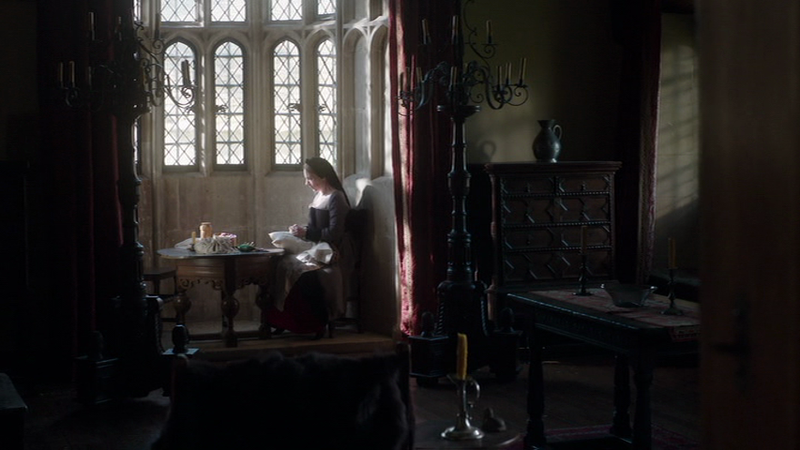 Two or three days ago Slater read the passage where Cromwell at home, once again picks up Liz’s prayer book. She had refused to read the Bible in English, would not listen to the liberating theology of Tyndale. There had been this uncrossable space between them, and yet he cherished the book. We see him muse over it at his desk, take it down from what seems to be a shelf (presumably in his bedroom); next to her name is the name of her first husband, and then below his own. This has hurt him out of jealousy — as also the names of their children together, two daughters because they died of the same sickness not long after, so out of grief and loss, and a son, now living still whom he does all he can for. The moment that means much to me is when he finds himself looking at the entry and crossing out her other husband’s name. He finds he can; he finds he feels better for this, looking about him. The whole thing no longer means as much or means differently. Beautifully authentically caught. In the book, in the film adaptation, Mantel as Cromwell, Rylance as Cromwell mourn for many others beyond Liz, and mourn for themselves too. This morning I found myself remembering a passage from Austen’s Sense and Sensibility (no need for me to have it read aloud to me, much less read it myself) where after she has the searing relevation that he has been engaged for four years to another woman, she reflects that no matter how busy she keeps herself, how much she refuses to indulge herself by remembering in solitude, there is still time enough for thoughts of him and what had been to rise to consciousness. But she holds firm, writes on at her desk (Sense and Sensibility was originally an epistolary novel). go swimming nearby, a six minute trip by car each way while listening to Wolf Hall, and then home to watch a beloved mini-series. But I felt terrible too. My unwillingness to go was a sign Jim was dead: with him there it would have been no trouble to go (he would have driven us, and had no trouble finding the place, and little trouble parking), I’d not have given it any thought; without him, watching these plays can be desolating as I’ve no one to talk to about them afterward. I cannot yet cross this out and yet I’m beginning to have no need to re-enact. This morning like Elinor I found the thoughts about this would rise to the surface. I made my routine up for the day, and determined that the way I am living is not done simply because I can’t break the yoke of what I used to do. These things before me — my writing, reading, task routine, my breaks (today again swimming nearby) however meaningless now or to others are what I am, what I enjoy doing, what I understand, get fulfillment from. I’ve counted four daffodils and three crocuses. They have come up out of the ground from the small plots I made that first year Jim was retired. I take no responsibility for their persistence. 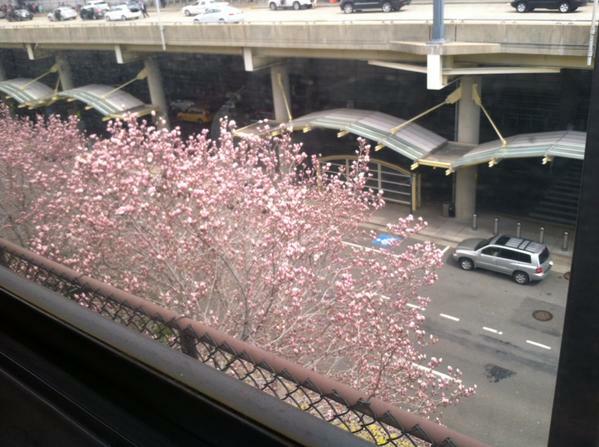 Since we had such a astonishingly cold February into March, in reality the flowering trees were rare today. In our neighborhood (called Clover) the only ones flowered were the very young; the tulip tree that hangs over my window has flowered on part of one side, and it looks like 3/4s will not make it. We had high winds yesterday and a couple of days of rain. 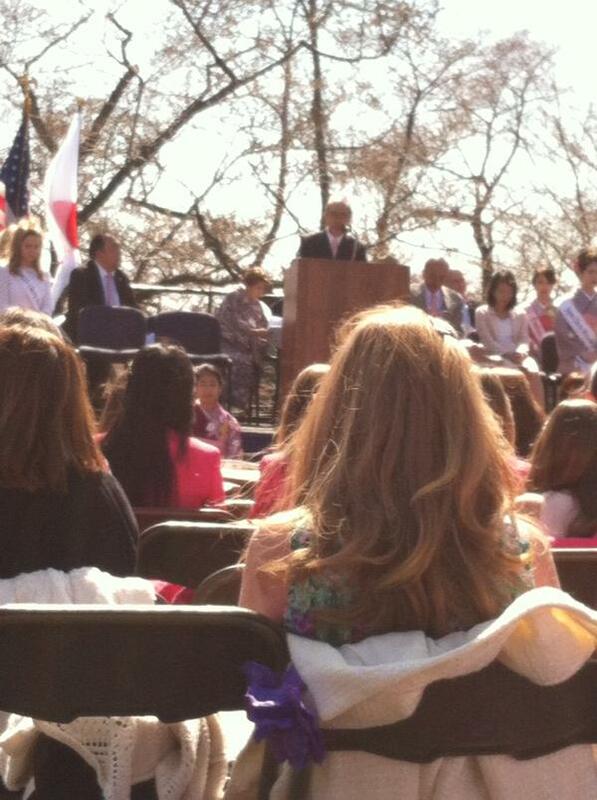 Yvette said the ceremony was lovely; there was a good speech by a Japanese clergyman (I’ll call him), and music. Jim and I used to observe Easter-time, spring, an equinox by going, most of the time with Yvette, to point-to-point races about an hour or more drive away into middle Virginia. It’s breeding time for the foxes so the elite hunting clubs host races, and the hoi polloi (like our small family) were invited to come too, and there would be bookies and tents of items to buy (I bought a big hat a couple of times), food. 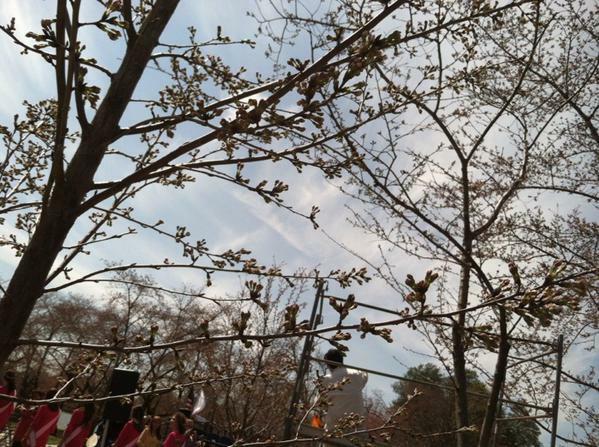 Sometimes the day would coincide with Easter or Passover, but not always. I’d come home exhausted from a long day’s outing. I remember Caroline came once and she bet with Jim (I’m not much on betting, my US working class background prohibits any enjoyment of this), but most years he’d bet alone with me looking on and sometimes chosing “our horse,” so we would have a horse & jockey we were “rooting” for and watch. We’d take his father’s indestructible binoculars, which his mother gave us after his father died of cancer. I remember the NYC festivals we’d join in on too. How do identities form? A lecture I went to on Friday night, the Washington Area Print Group’s monthly meeting at the Library of Congress prompts me to see this previous existence of mine and Yvette’s trip to DC to join in a local public ceremony as a matter of having an identity one can see oneself in. Vanessa Harding, a professor of history at Birbeck College, University of London, is spending a couple of months at the Folger Shakespeare library researching a learned 17th century book collector, and chronicler, Richard Smythe (1590-1670). Her research is into early modern London and published book is The Dead and Living in Paris and London (1500-16770) and she told us about the social and cultural world of this man as projected by his collection of books, his annotations in them, his unpublished papers (which he kept in the form of little booklets) and a published Obituary (list of all the people who died and how,from the famous and notorious to the children of his friends) during his life. 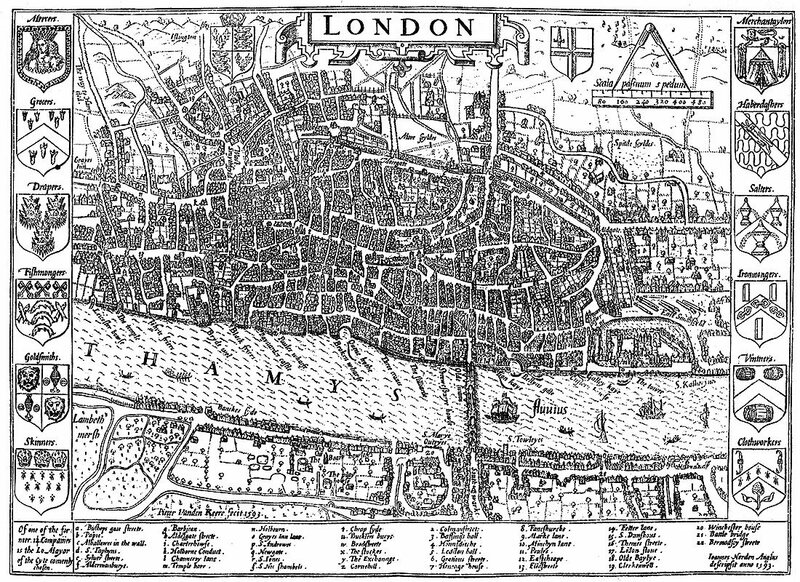 Prof Harding is just now developing a project with the Historic Towns Trust to map London on the eve of the Great Fire of 1666. So you can see she is interested in the larger city Smythe lived in. She held her audience’s interest all she was able to say of this obscure man (he never signed anything), and how his (in effect) scrapbooks carefully preserved contributed to a wider urban consciousness while that developing urban consciousness experienced in ceremonies (like the one Yvette attended and those she used to go to with Jim and I) sustained him. Prof Harding’s descriptions of these stitched together booklets, with their inserted pages, and portraits reminded me of descriptions of Renaissance women’s manuscripts to Jane Austen’s. He had a vast library for someone of this period (could she have said 2000? or was it 8000? ), and was known by other book collectors, sellers, learned and scientific people (acknowledged in some central sources); he was a polemicist for the Church of England (Anglican, and this during the interregnum too), and used books like Stowe’s Survey of London (1720, a massive folio edition), Fuller’s church history. Smythe was writing London’s history, which had a diverse rapidly changing population during his long lifetime. 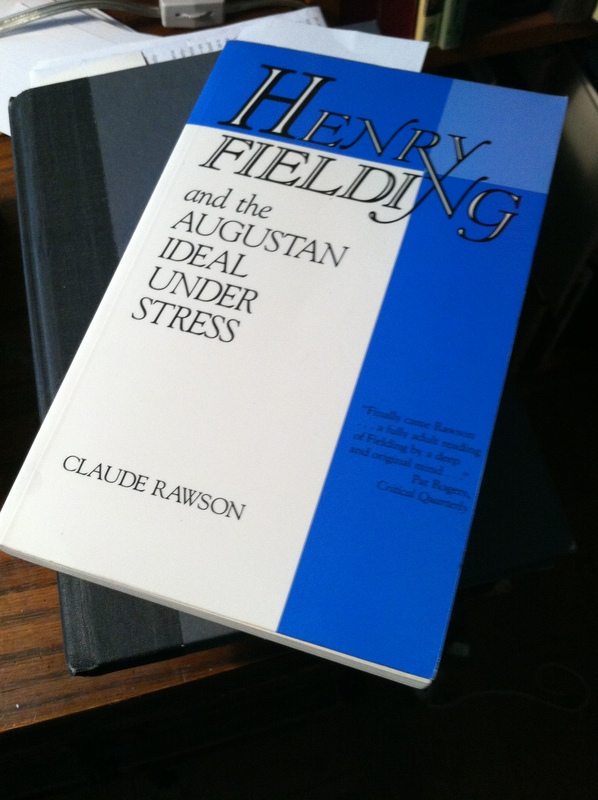 His personal contribution is that of a bibliographer (he left lists of books), of a corrector of misinformation. He was a socially gregarious man who was able to spend his time with like-minded men. Off he would go to Little Britain to look at books (St Paul’s became a center for book selling later). She talked of her frustrations over what he does not tell: he never described his library (by contrast, Pepys tells us he had modular bookcases). She was able to tell us of his wife, Elizabeth, whom he was married to for 44 years, a widowed daughter who he lived with in his last years and inherited his library. his sister-in-law became important to him after his wife’s death; he mentions other women friends. She told of how there were more records of him in St Giles, Cripplegate, but they were destroyed in WW2. As usual with me now I went with the group to dinner afterward, a nearby Thai place and the talk was good. Two people who are regulars are mounting an exhibition of Lewis Carroll books and memorabilia (we are talking 4700 items they own in their own library). The central field of research for one of the organizers of this group, Sabrina, is the early to mid-17th century and book history. The talk veered into university gossip and we talked of what is happening in Britain and the US to universities today, about online sites for research. I mentioned Future Learn and asked how much pressure there was for university academics and staff to participate in these online MOOCs, to get credit for being involved in communities. I probably drank too much or didn’t eat enough (pain in dentures prevents eating much), and going home alone I ended crying bitterly for Jim. I was glad this morning that Easter has remained a religious holiday (and passover too) and is not made into insistently public group rejoicing. I thought I’d bring spring in by staying longer in bed, and began Rumer Godden’s “middle brow” “woman’s novel” (both no-nos), China Court, a deeply felt evocation thus far of a house through the memories of an old woman who has just died, and those of her close servant, Cecily. Set in Cornwall. Books like this provide peace. My schedule had kept me very busy all week. Friday morning I had been to the JCC for Dance Fusion and Core, I taught (and think it went very well) at the two OLLIS, AU and Mason, Graham’s Ross Poldark and Demelza, and Trollope’s The Warden and Barchester Towers, respectively. Monday was especially wearing as I went into DC twice, the second time to watch an HD screening of a truly interesting production of Love’s Labor’s Lost done in Stratford by the Royal Shakespeare Company (Christopher Luscombe’s production, featuring Richard Bennet as Berowne and Benedick, and Michelle Terry as Rosaline and Beatrice). I hope to go again tomorrow after teaching and see Love’s Labor’s Won (Much Ado About Nothing) which my experience of Future Learn has shown me will be powerful; I did not realize that it was paired with an unusual production of Love’s Labor’s lost; I mean to write a blog on this pairing by Tuesday (strength holding out). Would I be doing any of this if he were here? maybe not. He might have found the HD production of these two plays; that’s the sort of thing he looked out for. A friend who is semi-retired told me of how he and his wife go kayaking in Florida for a couple of weeks of February. We never had a chance to evolve a retired life together, different from the one we had endured and enjoyed as working people together. Nonetheless, I found time late at night to watch all three 2 hour episodes of Ken Burn’s Cancer: the Empire of all Maladies, which appears to have been based on Pulitzer Prize winning book by Siddhartha Mukherjee who appeared in the film as a explanatory narrator. It was not as bad as I feared it might be. I did cry for the first hour and had a hard time watching it now and again, but although (as these shows did) it focused on the few people who lived because of these horrific treatments, and its outline was that of a story of progress, it told a tale of dysfunctional knowledge. Yes human beings have gone from knowing nothing and being able to do nothing about any cancer, to knowing a lot of details about specific manifestations (kinds of cancer) and having unpredictable ever-more narrowly targeted treatments where some people can be saved. Hard economic topics were avoided — like the use of devastating surgeries. And no individual groups were blamed. It was generally that prices are well beyond the means of many; that pollution is playing a major role. But at the close of the first two hours it was insisted that we do not know fundamentally what makes a cell turn cancerous. I learned what the mass mainstream media says about cancer. Meanwhile I read stories daily about people dying: a friend’s 10 year old niece died after she was first diagnosed at age 6. Unfortunate lovely child. Her photo appeared and story was told in a local Italian newspaper. Oliver Sacks tells of his embolization of his liver cancer (he is dying, NYRB April 23, 2015 issue); I read the increasingly poignant story told by Jenny Diski as she faces death from lung cancer. 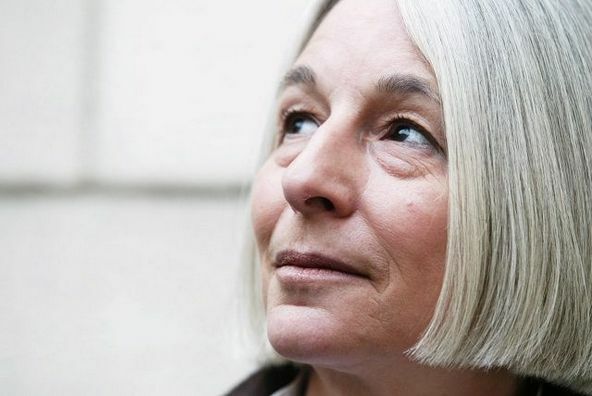 She has kept up a stages diary (LRB, 9 April 2015): how do you go about imagining your death? can you? After watching this determinedly upbeat presentation where all was done contradicted what Atul Gawande had said of not giving people false hope which drives them to make their last months miserable through torturous procedures (and Marcia Angell’s review of Being Mortal), but to tell them their prognosis so they can decide what they want to do with their last months, I wondered to myself after all, can people enjoy their last four months if they are told they are going to die? Look at Diski. She can’t forget it. Look at how Sacks is putting himself through such a horror of pain, himself a doctor. I wondered to myself if Jim had not been given false hope, would he have had the strength to enjoy a trip away or would he have ever wondered if he had tried, he would have had more life? he was extraordinarily patient in that last two weeks, brave, silent mostly, kind to me. What were his thoughts? I fear that he went for the surgery because he had decided he would not have been able to enjoy a trip away — probably though it was the false hope of five more years. Yvette at breakfast told me of a classic Japanese film, Ikiru, where a man is told he has only a few months to live and tries to do what he enjoys to experience a last happiness. He cannot. Daily life with others and his own dread will not permit this. What can he do with his last time alive. He conceives of a plan to make a meaningful contribution — to build a playground. What troubles and vexations he goes through to achieve this. The film seems to end with the playground built and him sitting on one of the swings and in flashbacks remembering back. The wikipedia article makes these last memories into something more peaceful than they are; but they do compensate. They kept him busy with a hope of some form of useful immortality. Yvette and I talked of our desire to have what we write on Net saved. I know many people talk of carrying on in their children and make do with that. I’ve put Ikiru on my Netflix queue as next. I’ve made a proposal to teach Henry Fielding’s Tom Jones next fall at the OLLI at AU. I realize I cannot do a second new course again and also a paper on Trollope for the Belgium conference and teach Framley Parsonage in summer. So I will offer to do the two Poldark novels at Mason in the fall. If that won’t do, sobeit. The next spring I’d love to work up a course on Gaskell’s North and South but it must wait. I am doing these courses for my own enjoyment of study and learning too. I keep getting thinner. Eating a problem. Gum ache and a dull hard pain: either one of my eyeteeth has now gone bad, or my jaw is sore from my denture and I can’t bite down. Now there’s not only, Can I bring myself to eat it? There’s, Am I successful at eating it? I have to wait until Friday to see the dentist. My clothes drop off me; my trousers grow longer, past my shoes. Bad moments: Thursday morning 3 viruses invaded my computer; within 2 minutes of my contacting him, my hero, my IT guy, Jonathan, had come into my computer by remote control and “quarantined them,” uninstalled Yahoo (the portal was the culprit) and after 3 hours of scrutiny, declared the computer fine, reinstalled Yahoo and I could be at peace again. I had one insight important to me this week in teaching the Poldark books and watching the fourth episode of the new (2015) Poldark: films can bring out graphically what is deeply appealing in a novel without discussing this explicitly: I have wondered why I love these books so. Well I saw in the fourth episode that what I love so is the relationship between Demelza and Ross Poldark: I identify utterly with her and find him intensely appealing through her eyes. Horsfield at long last was closely faithful to several long episodes at the close of Ross Poldark, allowing for the long scenes at the pilchard harvest, the visit of Verity and friendship with Demelza, the finding of copper, and finally at Christmas where the couple find themselves pulling apart as his upper class heritage closes in on them and then somehow manage to overcome this: they achieve communion of spirits walking home in the landscape as Verity, his close beloved cousin, has walked by his side with him. Far from this ancient imposing house, with its pictures, that hard social world, and in the night, the “old peculiar silence” ceases to make a barrier and “becomes a medium.” Their different pasts and personalities “could not just then break their companionship for long. Time had overawed them. Now it became their friend.” That’s how it was for us. 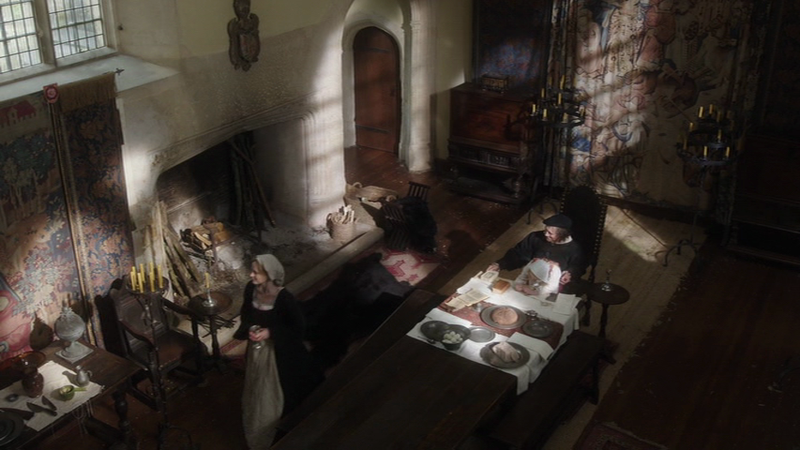 I also watched the first episode of Wolf Hall, the film adaptation mini-series from Hilary Mantel’s historical fiction. 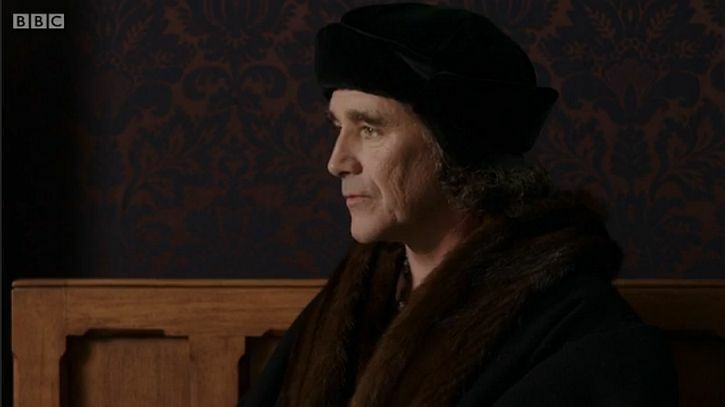 Mark Rylance as Thomas Cromwell the best new actor (to me) I’ve seen in a long time. He seemed to transcend the drama of wolves he is caught up in. 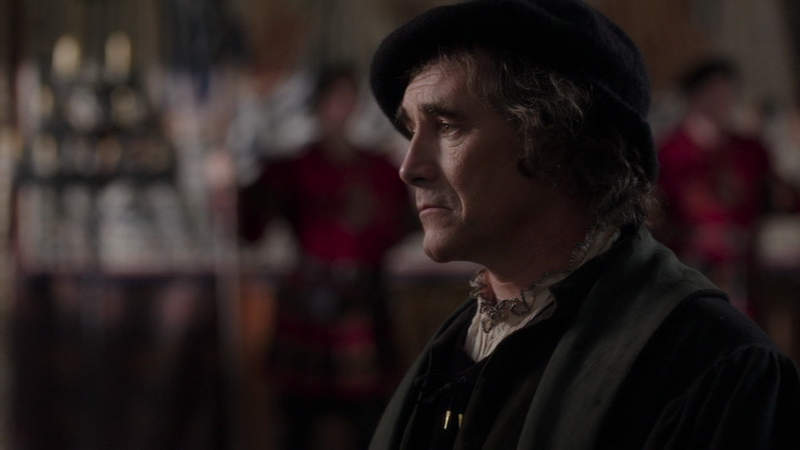 Heidi Thomas has made Rylance as Cromwell a quiet watcher, a POV, and Rylance in conveying how amoral, lying, snobbish to the nth degree, and awful everyone is to one another as some of them try to protect themselves (Cromwell’s father or brother by contrast savagely beats a boy servant or his son), conveys how strange costume drama itself is. He makes you feel how bizarre it is to watch these people in their extravagant outfits. His calm reasoning presence, and his stance in his outfit, unostentatious (yet rich and becoming — blacks and greys mostly), brought home how strange these costume dramas really are: a ritual version of our humanity. Hilary Mantel has re-seen most of the familiar characters: More (Anton Lesser, a great reader for books on CDs) is not the noble martyr, but a narrow minded dangerous man; Anne Boleyn (Claire Foy) sly and manipulative; Wolseley (Jonathan Pryce) is not a seething bully but a individual without the power to do what others want, and above all the striking change, is Thomas Cromwell, the ruthless politician, is now an ordinary decent man, lower class, quietly, intelligently, patiently trying to make his way. Making Stephen Gardiner (Mark Gatiss) important is historically accurate. How Bolt’s play, A Man for All Seasons, must’ve grated on Mantel. Henry VIII remains the same complicated enigmatic figure — in reality a fearful tyrant and more than half-mad by the end. Damien Lewis plays the role; he is as big a star as Bernard Cumberbatch. He’s not an heart-throb but is as ubiquitous in big parts. Joanne Whallay a dignified pathetic Katherine of Aragon. During the course of the first hour, Cromwell’s wife (the actress playing his wife was familiar to me, Natasha Little, once Becky Sharp, and very touching) and children (beloved by him) all die suddenly of the sweating (or sleeping) sickness as it was called. They did, and there was such a fatal illness which killed for a decade or so and then vanished. I fill my life at home with such presences.